Did you know that Oberlin was the scene of a series of heated public debates featuring renowned abolitionists William Lloyd Garrison and Frederick Douglass and their colleagues in the 1840s? Well, it was, and if you didn’t know that, you’re not alone! Even though the debates were attended by up to 3,000 people, the leaders in Oberlin at that time really weren’t all that keen about publicizing them. But I am, so here’s my blog about them. First some background. By the time William Lloyd Garrison came on the abolition scene in New England in the early 1830s, the abolitionist movement had already been thriving for decades in many states, including Ohio. But Garrison quickly realized the need to nationalize the movement, and together with the Tappan brothers of New York (Arthur and Lewis, benefactors of Oberlin College), he co-founded the American Anti-Slavery Society (AAS). This was an era of good feeling between abolitionists (Lewis Tappan praised Garrison as a “discreet, humble and faithful Christian”), and the national movement took off like wildfire, quickly engulfing Ohio and the newly formed colony of Oberlin. In its first seven years of operation, the AAS boasted almost 2,000 charter societies and 200,000 members nationwide. Yet in spite of all its initial success, cracks were developing in the organization right from the very beginning. Garrison was the editor of an anti-slavery newspaper in Boston called The Liberator. Although its circulation was small, Garrison wrote with a style that journalist Horace Greeley described as “bold, radical, earnest, eloquent, extravagant, denunciatory, egotistic.” This style got him national attention, but was always an irritant to some of his fellow abolitionists. But Garrison quickly became more and more radical and the list of people, groups and institutions he denounced grew ever longer. He denounced organized religion for maintaining relationships with slaveholders. He denounced the U.S. Constitution as a pro-slavery document, and encouraged abolitionists to withdraw from government altogether by refusing to vote or serve in public office. He would eventually even advocate dismemberment of the United States, under the slogan “No Union with Slaveholders.” But he also became an ardent pacifist, advocating “non-resistance” in all circumstances. And he brought abolitionist women into the cause, insisting that they be able to speak publicly in front of audiences comprised of both genders, which was considered taboo in that era. He insisted on equal rights for women as well as African Americans. Finally, by 1840, the Tappan brothers and many other abolitionists (including the Oberlin College faculty) came to believe that Garrison was “using the Society as an instrument” to promote ideas that he deemed “paramount to the Anti S[lavery] cause” with the result that “the slave has been lost sight of mainly.” So they withdrew from the AAS and formed the American and Foreign Anti-Slavery Society and a political party of their own called the Liberty Party, which focused exclusively on abolishing slavery through the church and government, within the constitutional framework of the United States. But Garrison was undeterred, and by the mid-1840s he launched a program to urge Ohio abolitionists to “come out” of the church, the government, and the federal union – a movement dubbed “come-outerism”. 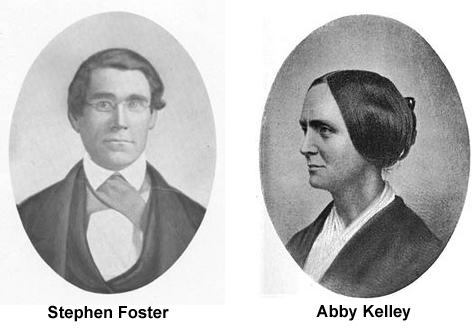 In the first wave of his effort, he sent Stephen Foster and Abby Kelley to Ohio as his ambassadors. Stephen Foster was a radical New England abolitionist who had been physically ejected from 24 New England churches and arrested 4 times for disrupting sermons with loud oratories of his own, frequently referring to the clergy as a “brotherhood of thieves”. Abby Kelley was a New England Quaker feminist and abolitionist who “came out” of the Quakers in 1841 over a dispute about allowing abolitionist speakers in meeting houses. In 1845 she married Stephen Foster and became Mrs. Abby Kelley Foster. Together they founded a western Garrisonian headquarters and newspaper, the Anti-Slavery Bugle, at Salem, Ohio. Mahan argued that the vague references to slavery in the Constitution didn’t constitute the “irresistible clearness” that would be required for “infringing rights and trampling down justice.” He argued further that even when the American colonies were under British rule, no slavery laws had ever been passed with sufficiently “irresistible clearness”. Thus slavery was, and always had been, an “illegal usurpation” in the United States and the American colonies. Yesterday at 10 o’clock we began our meetings in the church – nearly three thousand persons in attendance. Another was held in the afternoon, another in the evening, and this forenoon we have had another long session. Douglass and myself have done nearly all the talking on our side, friend Foster saying but little. The principal topics of discussion have been Come-outerism from the Church and the State. Pres. Mahan entered into the debate in favor of the US Constitution as an anti-slavery instrument and consequently of the Liberty Party. He was perfectly respectful and submitted to our interrogations with good temper and courtesy. As a disputant he is adroit and plausible, but neither vigorous nor profound. I shall say nothing about my visit here for the public eye until my return. What impression we made at Oberlin I cannot say, but I was abundantly satisfied as to the apparent effect. I think our visit was an important one and very timely withal. Unfortunately, that’s about all the information we have about the 1847 debates. The Oberlin Evangelist, which had summarized its long article about the 1846 debates by saying “the discussion is now over”, apparently meant it; they said not one word about the 1847 visit or debates. Garrison never wrote anything “for the public eye” after his return either, as he became deathly ill while in Cleveland, was incapacitated for weeks, and didn’t resume editing his newspaper until the following year. The Anti-Slavery Bugle may have summed it up best when it said, “The people, in short, had become so accustomed to hearing Disunion and Come-outer doctrines uttered with all the harshness and sternness of Luther’s reformatory spirit, that when Garrison and Douglass came, they appeared, by comparison, the Melanchthons of the cause.” We do know that a member of the audience wrote that “Prest. Mahan was masterly and dignified, overturning and scattering to the winds every position of his opponent.” And Mahan was highly impressed with Douglass, who he called “one of the greatest phenomena of the age… full of wit, human[ity], and pathos and sometimes mighty in invective.” Garrison and Douglass left town on good terms, with Professor Finney even loaning them his enormous revival tent to use in meetings around Ohio. So was the Constitution really pro-slavery, or was it anti-slavery? Well, perhaps it was both. In 1854, a new political party was founded on the premise that the Constitution protected slavery in the states where it already existed, but it provided no guarantees to expand it into the national territories, and that the Founding Fathers in fact opposed the expansion of slavery and hoped for its “ultimate extinction”. That party was the Republican Party. Ironically, the Republicans rose to power in the elections of 1860 with the help of votes and political action from many abolitionists. (Garrison himself refused to vote, although he also refused to denounce the Republicans, which led to a schism between him and the Fosters). Even more ironically, the victory of the Republican Party led to the attempted dismemberment of the Union by the slaveholders. And in the crowning irony, the slaveholders’ attempt at disunion ultimately led to the abolition of slavery nationwide, although in a manner few intended, expected, or desired. “Stephen Symonds Foster“, Portraits of American Abolitionists, Photo. Coll. 81, Massachusetts Historical Society Photo Archives.